By the age of four, Leslie Burr Howard already knew two things for certain: she liked horses and she liked speed. Stopwatch in hand, she’d throw her western saddle on her pony and time her rides as she raced around a track in her yard, trying to best her previous times. Without anyone to teach her, she was already headed for a goal – and after years of training and hard work, she would achieve Olympic Gold. At age 14 she began training with George Morris in nearby Pittstown, New Jersey. As a junior rider, just 15 years old, she won the 1972 ASPCA Maclay Finals at Madison Square Garden, laying the groundwork for success as an adult rider. She won AGA Horse of the Year awards in 1983 with Albany and in 1984 was named AGA Rider of the Year, a golden year indeed for she and Albany competed on the USET squad at the Olympic Games in Los Angeles, and captured the Gold medal. Two years later, she won the FEI World Cup Finals in Gothenburg, Sweden riding McLain, and was named American Horse Show’s Equestrian of the Year. She had another great horse loaned to her in 1992, when she took over the reins of the famed Gem Twist for injured rider Greg Best. The two won Horse of the Year. 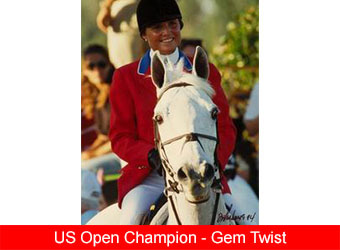 In 1994, Leslie again represented the U.S. at the World Equestrian Games in The Netherlands. She rode Gem Twist and Charisma to a 1st place tie in the USET Show Jumping Championships at the Bayer/USET Festival of Champions in Gladstone, NJ. 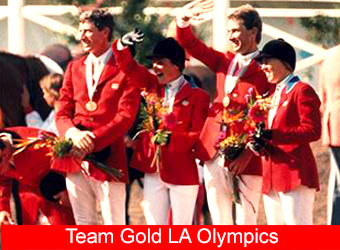 In 1996, Leslie again represented the United States at the Olympic Games, riding Jane Clarks Extreme. The U.S. took the team Silver Medal in Atlanta. By 1997 Leslie had been honored by USET with the Whitney Stone Cup, and won the world’s richest Grand Prix event, the du Maurier Ltd. International at Spruce Meadows in Calgary riding S’Blieft. She represented the USET and won the first Samsung Nations Cup Series that year. Her accomplishments have continued to place her high in the national standings, earning the Team Silver Medal at the Pan American Games in 1999, riding Jane Clarks Cloverleaf. Leading the USA East Coast FEI World Cup League in 2000, and winning the Queen Elizabeth II Cup in Calgary aboard Judy Garafalo’s Priobert de Kalvarie. She competed internationally and won several prestigious Grand Prix events in Europe including World Cup qualifiers in Amsterdam and S'Hertogenbosch. Since 2005, riding Youp, she has won the highest number of Grand Prix events on the Florida circuit, as well as the Chrysler Classic Derby at Spruce Meadows. Leslie is based out of Redgate Farm in Newtown, Connecticut, with her company, Burr Associates Inc. It is a state-of-the-art Grand Prix training facility with two large Grand Prix fields, a sand arena, and an indoor arena. “It has every single obstacle imaginable,” says Leslie, including water jumps, liverpools, a graub, different types of ditches, and several types of banks. Ten employees work at the barn, which has been in operation for ten years, and is home to clients’ equitation horses and hunters as well as the jumpers. Leslie competed exclusively out of Fairfield County Hunt Club from 1978 until about ten years ago. Parallel to her love of competing is her love of teaching, Leslie’s influence can be seen in the rides of some of today’s top Show Jumpers, including Kent Farrington, Molly Ashe Cawley, Christine Trible McCrea, Judy Garofalo Torres, Nicole Shahinian Simpson, Lisa Jacquin, Marley Goodman, Mary Shirley, and Debbie Dolan.